Good Vibes on Main is a Life is Good shop located on historic Main Street in Newmarket, Ontario, nestled among unique shops and restaurants, and just half an hour north of Toronto. The newly renovated Riverwalk Commons is home to the Saturday farmers market and kids (of all ages!) splashpad in the summer months. In the winter, the splashpad is converted into an outdoor ice rink, surrounded by thousands of christmas lights! Historic Main Street is the perfect spot to spend a day of discovery, shopping and great food! 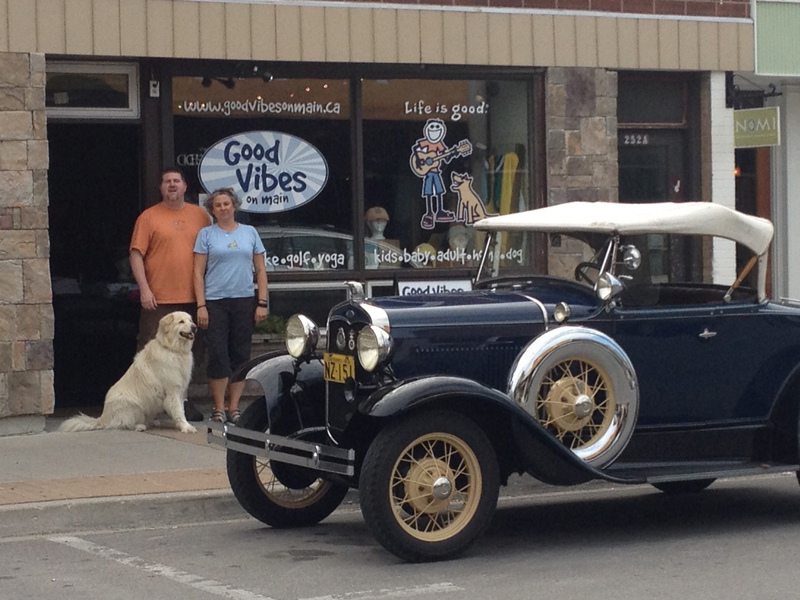 Owned and operated by us - Ken and Vickie Sparks and our Chief Operating Canine, Kody, our goal is to spread optimism and good vibes to one and all! We have been fans of LIG for years now - since we first encountered it in San Diego while on holiday. We connected immediately to the brand because of Rocket, but ultimately, it was the positive messages that truly resonated with us. When we decided we needed a career and lifestyle change, it was an easy choice to open a LIG store. Location was important to us. We wanted a Main Street feel - a community that supported local businesses and local residents; and Newmarket became the obvious choice. So we sold our house in Toronto, moved to Newmarket and set up shop! And we haven't looked back since! We both bring lots of customer service experience to the store - in fact, we met while working at the Fairmont Royal York in Toronto, as well as a passion for our community. Supporting our community through fundraising, sponsorships and engagement is a fundamental part our our business, as we believe strongly in giving back - it has always been part of who we are, and it is just natural to extend that into our business as well. Vickie was born in England, and came to Toronto as a nanny, supposedly for a year. That was almost thirty years ago! Over the years, Vickie has developed extensive communications, graphic design and event management experience - which she uses everyday! Ken is originally from the Sault, but grew up in and around Toronto. He brings over ten years of project management experience to the mix, as well as a real passion for customer service. Kody is the COC (Chief Operating Canine) at Good Vibes on Main. He is a fourteen year old lab mix who loves to meet new people, give kisses, take long naps at the store and eating cookies! Catch up on the latest good vibes on our blog!